[147 Pages Report] The global well completion equipment and services market is expected to grow from an estimated USD 8.98 Billion in 2016 to USD 11.09 Billion by 2021, at a CAGR of 4.31% from 2016 to 2021. Factors such as refracking of mature oil & gas wells and resuming shale operations are driving the market worldwide. This research study involved extensive usage of secondary sources, directories, and databases (such as Hoovers, Bloomberg, Businessweek, and Factiva) to identify and collect information useful for this technical, market-oriented, and commercial study of well completion equipment & services. The points mentioned below explain the research methodology applied in making this report. The well completion equipment & services market starts with the manufacturing of equipment such as packers and liner hanger among others. Schlumberger Ltd. (U.S.), Halliburton Company (U.S.), and Baker Hughes, Inc. (U.S.), among others are the leading equipment & service providers. The final stage covers oil & gas field operators. The prominent operators are BP p.l.c. (U.K.), Total S.A. (France), and Royal Dutch Shell plc (The Netherlands), among others. The well completion equipment & services market is projected to grow at a CAGR of 4.31% from 2016 to 2021 to reach USD 11.09 Billion by 2021. Refracking of mature oil & gas wells and resuming shale operations are the major factors driving the market. The report segments the well completion equipment & services market on the basis of application into onshore and offshore. The offshore application is projected to grow at the fastest pace during the forecast period. The dwindling oil & gas reserves in the onshore fields have forced the operators to venture into offshore regions. This trend is likely to continue in the future as the increase in the production from the deepwater and ultra-deepwater reservoirs will drive the demand for the well completion equipment & services as well. Based on type, the well completion equipment & services market has been categorized into packers, sand control tools, multistage fracturing tools, liner hangers, valves, smart wells, and others. The packers segment holds the largest market size, and is projected to grow at the highest rate during the forecast period. This is because packers are the most common and most widely used completion equipment. Though it costs less when compared to other equipment, the large number of units used tends to increase its market size in terms of value. 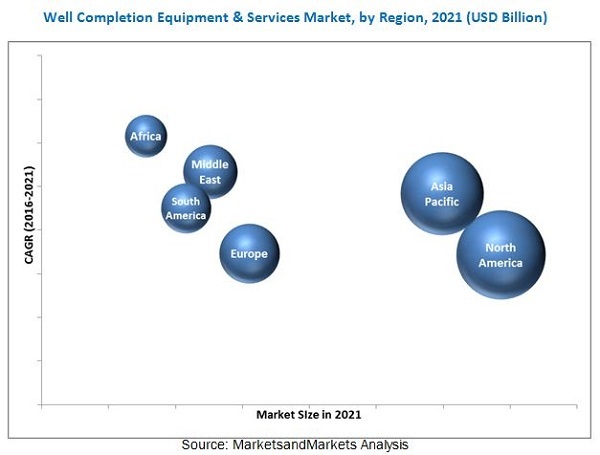 In this report, the well completion equipment & services market has been analyzed with respect to the following regions, namely, North America, South America, Europe, Africa, the Middle East and Asia-Pacific. North America is currently the largest market for well completion equipment & services, followed by Asia-Pacific and Europe. In North America, the growth of the well completion equipment & services market can primarily be attributed to factors such as shale revolution and presence of large drilled but not completed (DUC) wells, particularly in the U.S. The figure given below shows the regional scenario of the well completion equipment & services market from 2016 to 2021. The demand for well completion equipment & services can be directly linked to the increase in rig count, well count, and upstream oil & gas expenditure. Reduction in exploratory drilling and oil price decline restrains the market growth to a certain extent, with pricing pressure issues being significant challenge of this market. However, arctic explorations offer lucrative growth opportunities for the well completion equipment & services market. 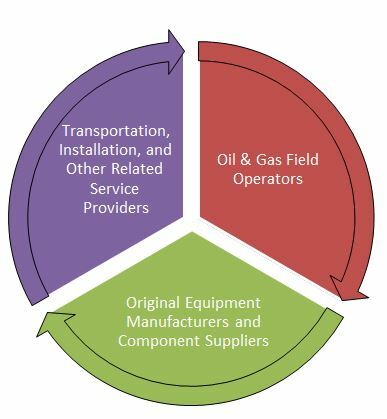 Some of the leading players in the well completion equipment & services market include Schlumberger Ltd. (U.S.), Halliburton Company (U.S.), Baker Hughes, Inc. (U.S.), Weatherford International Plc (Ireland), and National Oilwell Varco, Inc. (U.S.) among others. Mergers & acquisitions was the most common strategy adopted by the top players in the market, constituting almost one-third of the total development share. It was followed by new product launches, contracts & agreements, and expansions, respectively. 10.8 National Oilwell Varco, Inc.
10.9 Packers Plus Energy Services Inc.
10.13 Trican Well Service Ltd.
Table 1 Drilling Permits (Data for March), U.S. Figure 20 Drilling Permits (Data for March), U.S.